CHILDREN WHO GO TO BED EARLY, GET UP EARLY. CHILDREN WHO GO - ProudMummy.com the Web's Community for Mums. CHILDREN WHO GO TO BED EARLY, GET UP EARLY. 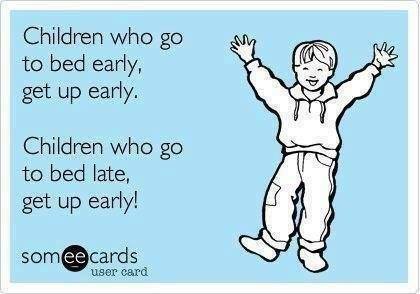 CHILDREN WHO GO TO BED LATE, GET UP EARLY! Kayleigh Safadi Carly Cogan don't we know it!! Danielle Allan Fox lol tommy! !